The time has come, K-pop fans! BTS has finally arrived at the 2019 Grammys. Not surprisingly, the K-pop group pulled out all the stops with their fashion and beauty looks for the star-studded event. Wearing electrifying get-ups, they each put their own spin on their outfits. Notably, the group's members, Jin, Suga, J-Hope, Jimin, V: The Series, RM and Jungkook wore black suit jackets and white shirts, but some members opted for white ties, bow ties or no ties at all. Plus, colorful hair was on full display. Jimin rocked an awesome pink 'do on the carpet. All members of the K-pop band except for J-Hope wore Jay Baek Couture. J-Hope instead wore a suit by Kim Seo Ryong. While the Grammy Awards are known for its fun red carpet fashion, BTS is taking it to another level. Although, their "terrific" fans wouldn't expect anything less, let's be real. Speaking to Ryan Seacrest on E! 's Live From the Red Carpet, the "Idols" singers talked about their music and tour. "Well, we've been touring around the world," they said. "We've just been working on our next album." "It's a dream come true," the band added. 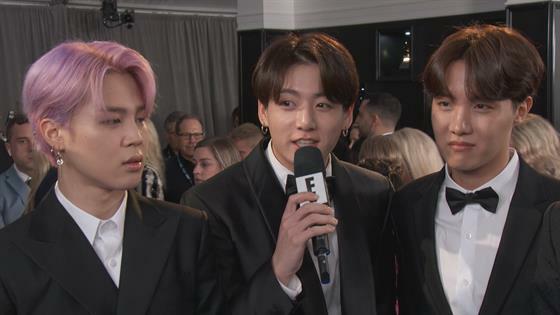 The BTS Army, the name for the band's fan base, received a special shout-out during the interview with Seacrest. "It's a blessing we get so much love for doing what we love to do. We are so thankful," they said. Luckily, fans will get to see more of the K-pop group tonight since they are presenters, which marks the first time they've done this Stateside, Variety reports. While the "Fake Love" singers are definitely making a splash at the 2019 Grammys, fans were bummed to learn they were only nominated for Best Recording Package, which is a nomination for their album artwork for Love Yourself: Tear. Sadly, BTS isn't going home with a Grammy tonight. St. Vincent's Masseduction won. The list of nominees in the category also included, The Chairman's The Offering, Foxhole's Well Kept Thing and Mitski's Be the Cowboy. Even if the K-pop group doesn't take home a Grammy for their album artwork, they've already won the hearts of their devoted fans. Stay up-to-date with all the Grammy winners here.